Ken Huizenga, production manager, stands before our HP Indigo 5000 Digital Press, as it makes its way out of our print shop. 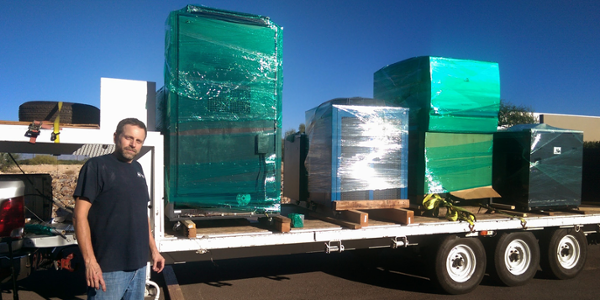 There are 5,000 ways to say goodbye... to our HP Indigo 5000 Digital Press, that is. Technology keeps improving and so do we. To make room for our newest, state-of-the-art digital press, it was necessary to say goodbye to our dear friend - 8 years and 40 million impressions later. We are told that our Indigo 5000 is going to a good, new home overseas and we are confident that it will provide its new owners with the same amazing benefits it gave us. A happy ending! When we purchased the press in 2006 as one of Tucson's first digital presses to use variable data and images to personalize direct mail, our Production Manager, Ken Huizenga, was a huge skeptic. As an "old school" offset printer, he was certain this newfangled digital press could not produce to the quality level of an offset press. Let's just say that the skeptic was soon converted and became a true believer. This equipment enabled digital printing to be comparable in quality to offset, it could turn jobs around on very short notice, it made short-run, full color jobs affordable, and, of course, was the ideal (and only) tool to enable variable content materials. The concept of digitally-produced materials started rather slowly at first,but grew nicely as people experienced the quality, speed, and affordability of smaller quantities. The dynamic growth came, however, when clients experienced the positive impact provided by personalization and segmented marketing - enhancements available only with a digital press. Spectrum purchased a second HP Indigo digital press (a 5500) three years ago to meet volume demands and increase the scope of project capabilities such as white ink and thicker substrates. It continues to be our main workhorse making impressions - figuratively and literally, every day. Now, taking the place of our dear friend, is the latest in digital press capability. In fact, ours is the first installation in the State of Arizona. Following our philosophy of providing more to our clients, it too, expands our capabilities ever further. We invite you to come in and TAKE A TOUR OF OUR SHOP WITH US to see, firsthand, our latest and greatest to help you with your next printing and mailing project. Call us at (520) 571-1114 to schedule your personal tour today.